Having now received all of my various slips, forms and receipts, I no longer have any excuses left to avoid doing our household income tax. I even broke down and bought the world’s most user friendly tax software to make the experience as painless as possible. Nevertheless, tax time is not fun. Going over your finances for the past year, looking at where you are and what you spent and what you saved (or didn’t save) for retirement raises all kinds of deeply emotional issues. This should be a time of reflection, where I examine my relationship with money and my goals for the future, think about where I want to be in 5 years, but every year I just get through the tax forms as quickly as possible and hope that the refund is enough for a trip to an all-inclusive resort in Cuba. How I love the sound of clinking money! That beautiful sound of cold hard cash! 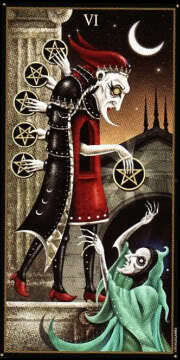 This morning I pulled the 6 of Pentacles as my card of the day. Every morning I pull one Tarot card, I don’t over analyze why, I just see it as a point of reflection that can apply to everyone, as personal advice for myself for the day, and as a means to deepen my relationship with my cards. So, today, the 6 of Pentacles – I’ve looked at this card many times, but perhaps in light of the impending tax deadline, it bowled me over with how much is going on there. In the scene on this card, we see a clearly affluent, high-status man dripping a few small coins into the hands of a poor beggar who is kneeling at his feet. The rich man holds his own hand in what looks like a gesture of blessing, as he looks down into the face of the humble man gazing up at him gratefully. This all seems very nice at first glance, a benefactor helping someone in need. But, as you look closer, some troubling images emerge. Why isn’t the rich man handing the coins directly to the beggar, is he afraid touching him will compromise him in some way? And what about the other kneeling figure in blue, why isn’t he receiving any charity? Does the rich man use the scales he’s holding for balance and equality, or to render judgement? Did he weigh the quality of the two men and find one lacking? Is he using the scales to decide who deserves help, or to weigh out how much they deserve? Regardless, that’s some pretty small change he doles out. There is a slightly surreal quality to the entire scene, with the background of floating pentacles/coins that don’t make it down to earth, and the figures that look like actors on a stage (this is one of the RWS “stage cards”). There is the feeling that what we are seeing isn’t the whole story, that things aren’t quite as they seem on the surface. When this card comes up in a reading, whether is it in reference to a romantic or familial relationship, or a career situation, the first question to ask is who do you identify with in the scene: the rich benefactor, or the downtrodden beggar. In my experience, your immediate gut reaction says everything here. 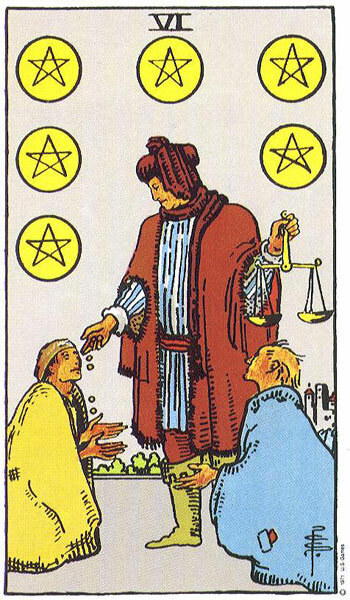 The 6 of Pentacles can be about generosity and getting what you need, but I find that it most often indicates an imbalance in a relationship due to financial issues of some kind. It’s important to know how you fit into the situation, and to understand how the dynamics in any relationship are affected by finances and who controls them. Let’s take a look at what this card can mean if it appears in a relationship spread. If you see yourself in the rich man, you may genuinely intend to be open and generous with a partner who has less resources than you, but take care to be sensitive to the fact that your partner may be feeling guilty or down on themselves because of the disparity in what you both contribute to the household. You may feel that this is a waste of energy and that your partner has no reason to feel this way, but try not to just dismiss their concerns out of hand. Also, if you are going to give, give with an open heart, without judgement or resentment. This card is telling you loud and clear, don’t use your money as a means of controlling your partner or of boosting your own ego. Remember, fortunes change throughout the course of a relationship, the idea is to provide whatever support is needed at the time, not to keep score. In a career situation, if you see yourself as one of the beggars in the card, you may be feeling like you are not getting properly financially rewarded or recognized for your efforts, and that you are at the mercy of the good will of those higher up than you. Of course, this creates resentment and frustration, and rather than letting these negative emotions simmer away in your mind and heart, it may be time to reevaluate your job situation and future prospects. Will you be able to achieve the level of pay and security that you desire in this job? If not, what does that mean for you? What’s stopping you from making a career change now? If, however, you identify with the dominant figure in the card, reflect on how you treat the employees that fall under your management. Do you create a supportive environment of possibility and encouragement, or do you use the threat of penalty or dismissal to keep people in line? What kind of working atmosphere do you want to foster, and if it’s a negative one, why is this? Be honest with yourself if your motivations are coming from fear or insecurity. When the 6 of Pentacles appears in a daily draw or in your Tarot reading, it may be time to examine your relationship with money, and how this affects your self-worth, personal relationships, and business dynamics. How much money do you need, really need, to be happy and fulfilled? How do you use your money, for the benefit of yourself and others? If you are feeling lack, is it really because of your financial situation, or does the issue run deeper than this? 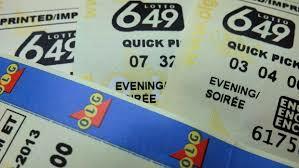 In any situation, romantic or career, if you don’t deal honestly with these monetary issues they have a tendency to creep into all aspects of your life and take on an importance that may not be warranted. The 6 of Pentacles asks you to be aware of wielding power in a responsible way, to give generously when you can, and to receive graciously when you have need. Be honest with yourself and the people in your life when it comes to money to avoid resentment and misunderstanding. Wow, great post. I love to hat you said about balance in a relationship.